The only problem we had was figuring out which hikes to do! 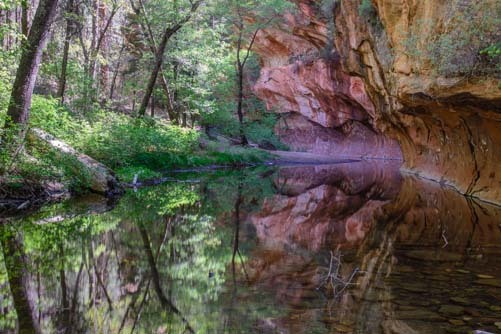 There are over 250 hiking trails in the Sedona area, and each has its own character and highlights. Some are easy, while others are hard. 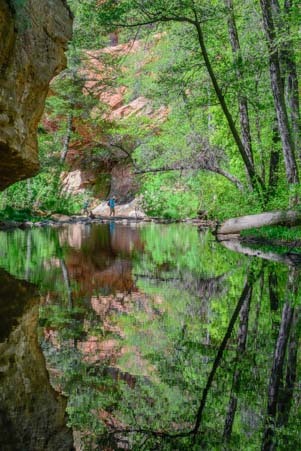 Some climb mountain sides, while others follow creeks and streams through canyons. All of them, of course, are scenic and beautiful. So which do you choose? I was getting nowhere searching the internet. We stopped by the local camera shop, Rollie’s Camera, to look at the photography gear they had for sale, and we ended up talking at length with the shopkeeper (and pro photographer), Tom. 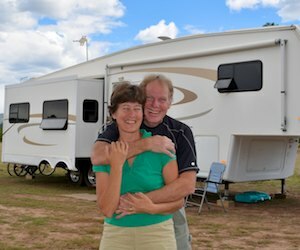 Besides selling us two excellent camera straps that are much better padded than our Nikon straps and can be unclipped easily when we want to use a tripod, he also gave us recommendations for hikes to try. perfect lunch stop by the water. 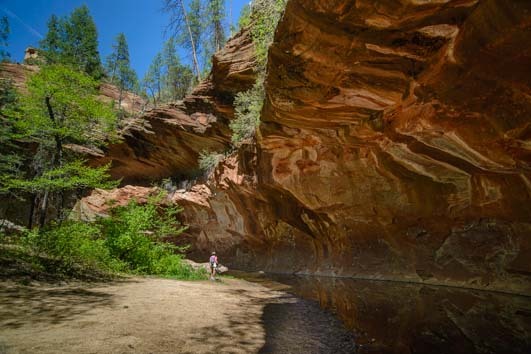 He suggested that we’d find lots of great photo ops on the West Fork Hiking Trail. That turned out to be an understatement. What a glorious hike this is, and so different than the mountain biking trails we had ridden between the mammoth red rock formations! 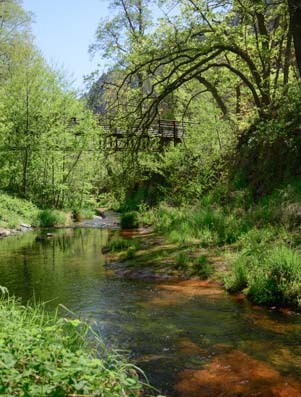 The true magic of this trail lies in the water. The trail snakes alongside a little meandering stream and crosses it here and there. 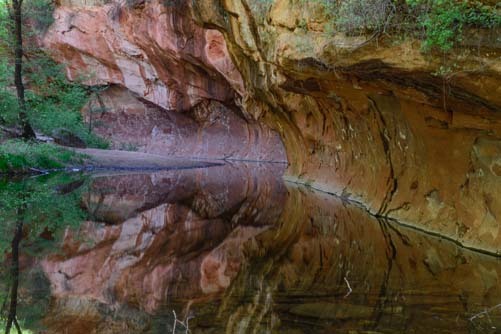 In places, graceful red rock cliffs arch over the stream and reflect their rich colors in the water. I can only imagine what this place looks like in the fall when the leaves turn golden and red. We will have to come back and see!! We hung out a little more at the special red rock overhangs on our return trip. About halfway along the trail the woods parted completely and wide flat rocks spread out on either side of the trail. 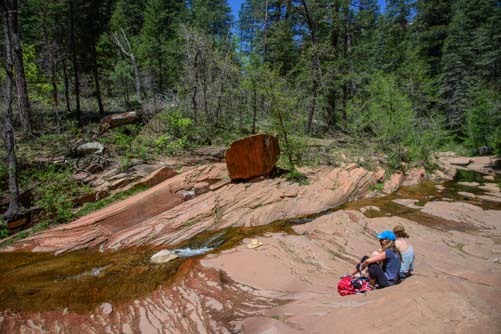 Several hikers had stopped to take a break, and one couple had stripped down to their bathing suits to get a tan! We didn’t go quite that far, but we munched on granola bars and basked in the lovely contrast of the cool green woods and the hot red rocks. The cliffs towered above us, in all their vibrant red splendor, while the tall trees’ leaves spread out like lace against them. We followed the trail for quite a distance, crossing the stream a few more times, and then we turned back. When we returned to the section with the wonderful rock overhangs, two guys were there throwing pebbles in the water. They kept looking up at the rock ceiling above them and pointing. 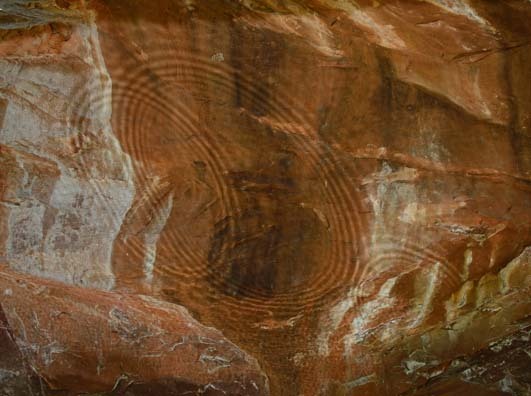 Following where they were pointing, we saw that the lighting had changed since we’d been there before, and now the sun was lighting ripples in the water and reflecting them back up onto the rock overhang. The guys moved on, and so we took over, picking up tiny pebbles — smaller than a ladybug — and flicking them into the water. 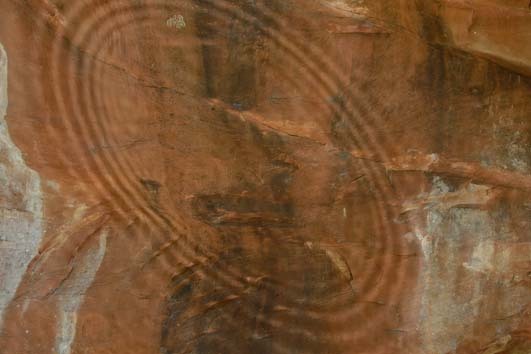 It took us a while to figure out exactly where to toss the pebbles to get the ripple reflections where we wanted them on the rock ceiling, but what a fantastic effect!! We were mesmerized and played with this for quite some time! 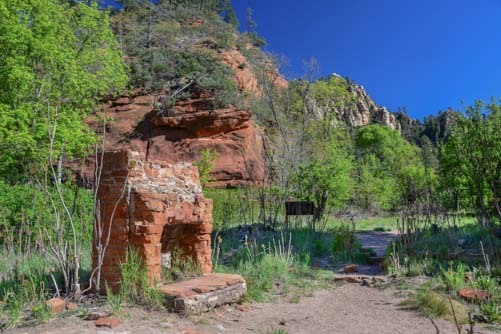 Another magical spot on this hike is at the very beginning (or end) of the trail at the Mayhew Lodge ruins. This little homestead actually became a rustic retreat for some of the mid-20th century’s more notable people, including President Hoover, Jimmy Stewart and Walt Disney. Sadly, after the National Forest Service bought the property in 1968, it burned down. Now the old brick hearth that was once the centerpiece of the homestead stands alone in a clearing, seeming both homey and eerie at the same time. 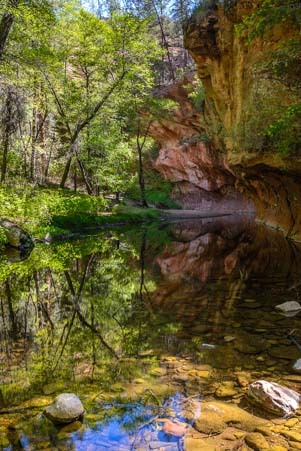 Once again, we found that Sedona had bewitched us. At first we had been transfixed by the dramatic red rock views as we drove around town. 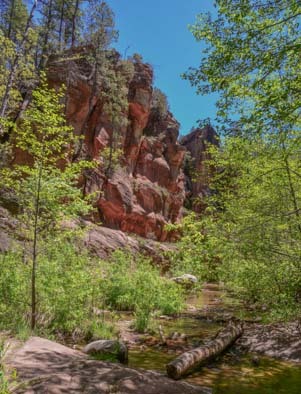 Then we were drawn into Sedona’s heart by the wonderful mountain biking trails through the exotic and fiery red rock landscapes. 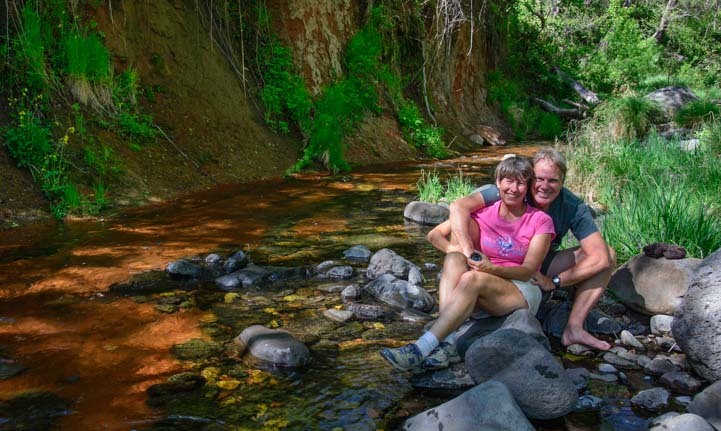 Now we had discovered Sedona’s cooler side where life is made lush by the moisture of the creeks. This was a place that had grabbed us and wouldn’t let go!! 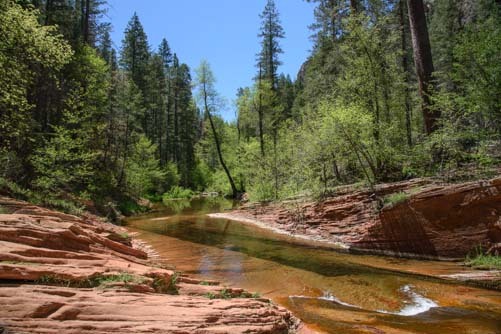 This entry was posted in Arizona and tagged Arizona, Hiking Red Rocks, New, Red Rock Country, Sedona Arizona, Travel, USA, WP Travel by Roads Less Traveled. Bookmark the permalink.